Ooh, I like those men at arms alot! Thank you for posting Davidian, and your flesh tones turned out very nice! It is interesting that they choose to have the main colors of both factions be white and red for their launch minis. From a distance, they will look pretty samey. Also very interesting to see them multi based. Can't wait to hear back reports from Essen. Every time I see those archers and that brute I'm surprised nobody went and gave them that pallid skin look that the Dirz guys all had. Looking forward to hearing about some demos next weekend! The game is designed for play on a 4x4" board and give the mass war feel with far fewer physical minis than conventional mass wargames have come to expect. Whilst on round bases, multibase movement trays are incorporated to improve in game admin yet models are removed individually to indicate casualties. Units enter play dependant on their level. Low level skirmishes take place early on to establish the front lines where reinforcements get to deploy from almost any table edge using the Offside mechanic where pushing the enemy line further your reinforcements to deploy closer to the lines ending in much grander clashes as the game escalates. The Spire Abomination... Oh my! Big fan of the men at arms, but the spire stuff doesnt appeal to me much. Im hopeful that a third faction a bit less. 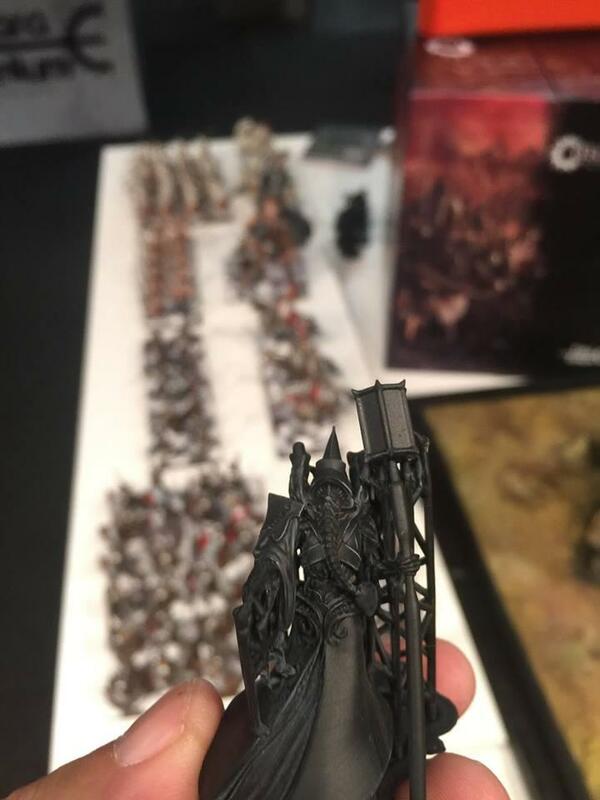 Gw chaos meets kingdom death pops up. Ah, well four factions are planned for initial release, the Spire, The Hundred Kingdoms (where the man at arms slot in), the Nords (self explanatory I think) and the Dweghom... Something mentioned about dragons blood but again, being awfully cryptic about this last faction. Also, more factions planned as a second/third wave to introduce different styles of play. Those men at arms look interesting, but the spearmen... are they completely unposeable? I see what you mean by "clone"! That spire abomination thing looks pretty mental! Wonder what material it's going to be made out of? Getting a very good (as mentioned earlier) Confrontation Dirz vibe from the Spire - very nice! Wasn't able to finish the whole video, but like what I saw a lot! 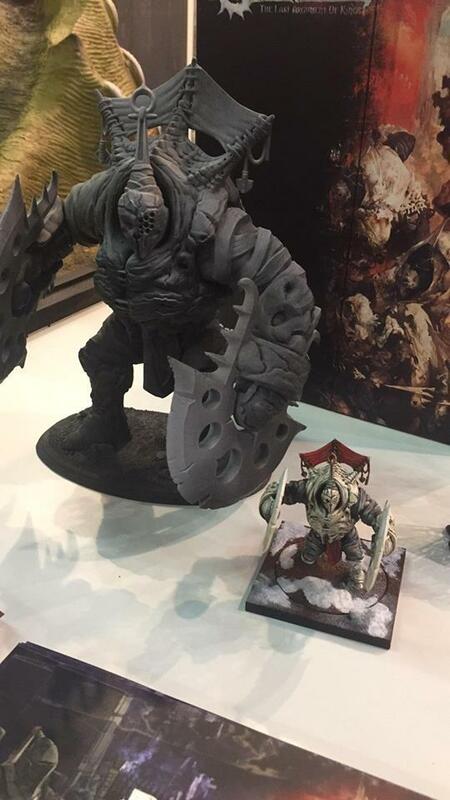 The Para Bellum guy said they won't be doing a Kickstarter and that the miniatures we be plastic and on sprues (which I interpret as HIPS plastic)! If that doesn't get people to pay attention I don't know what will. Also there were human guys with big two handed swords and knights. The mechanics also looked interesting: You use a deck of cards that you order to control which of your units activate when, the game begins with an empty board with light units showing up first, followed by medium then the heavies as the game progresses. Morale failures cause causulties rather than whole units turning tail. The big spire abomination looks awesome. You nailed it mate. They will be in hard plastic. Also, if units loose heavy casualties, they become broken, where RALLY becomes a mandatory first action. Stanrs are in terms of class, a class 3 marksman rolls to hit on a 1,2 or three so like gates of Antares, it's high stat low roll. This is looking really good, anyone know if some kind of Undead or swarming army is going to show up in this game soon? I miss having a WHFB undead army and I really like what this game is trying to do for 28mm mass battles (by making them less massive). The 4 planned factions for release are the spire and hundred Kingdoms in the demo. Nords and the ancient Dweghom (absolutely no idea about them). But that is just for starters. There will be further waves of factions for release. I'll ask for you mate. I finished watching the video. The mechanic if being able to bring in your reinforcements up to the distance on the board you control is brilliant. The rules sound great. Davidian, any chance we can get a scale shot of the spire dudes you have on hand? I want to understand what 35mm means in context of the other fantasy miniatures I own. I have a few that might give you an idea. Thr brute drones are massive even by infantry standard, the archers are 45mm tall.. I'm not at home atm but the best I can do are these atm... you might be able to get an idea. I have to say, th esizer of them makes them so easy to paint but the infantry are no bigger than say, a priamris space marine. That’s just a 3up isn’t it? With arms positioned slightly different from the smaller model. This game is looking really cool... Both miniatures and what little background I have seen so far look really intriguing. Does anyone know when it will be released? The hundred kingdom guys look interesting. IT requieres a LOT of guts to go in for a mass battle game instead of just the standard route of a kickstarter boardgame with a gazillion pvc monsters. I know it fits the description of mass battle but with big models and a 4x4" field of battle, you won't have to invest in the vast amount of models that has become the status quo in recent years. 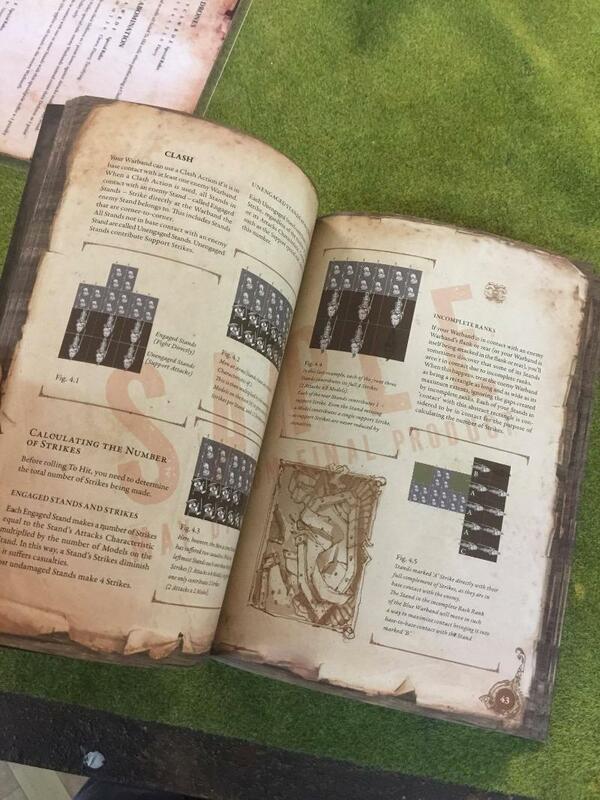 The biggest units you'll be likely to field will be 6 stands of infantry (24 models). 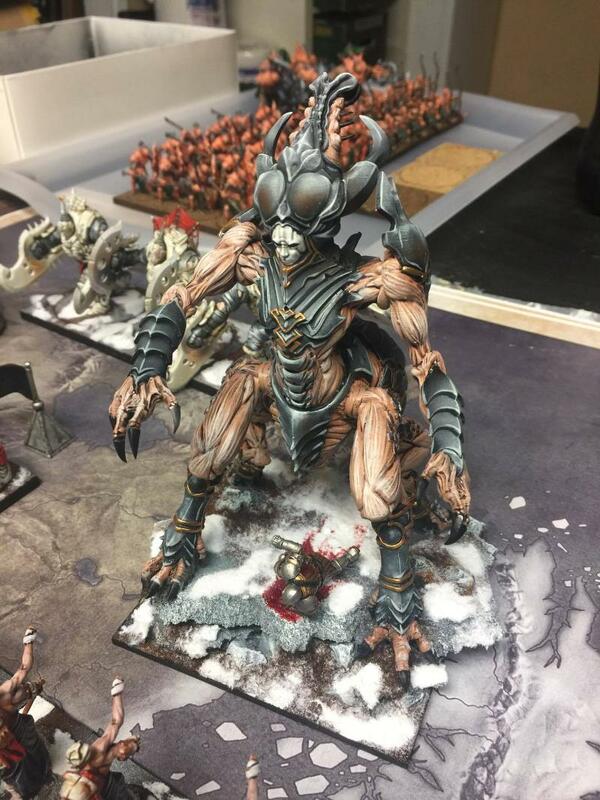 Those are some really beautifully painted minis! The bone-archer is very cool, assume you would have a higher rate of fire with the three arms! Ah, well the Spire Clone archers are Rank 3 marksmen. What this means, is that with each ranged attack they make, they succeed to hit with each D6 roll of a 1(Ace), 2 or 3. Hmm my interest for this game is slowly increasing. One thing that might make things a little awkward for me though is my gaming table is exactly 4x4 and the mass units deploying from offboard thing could make things somewhat cumbersome. Well fear not then dude! 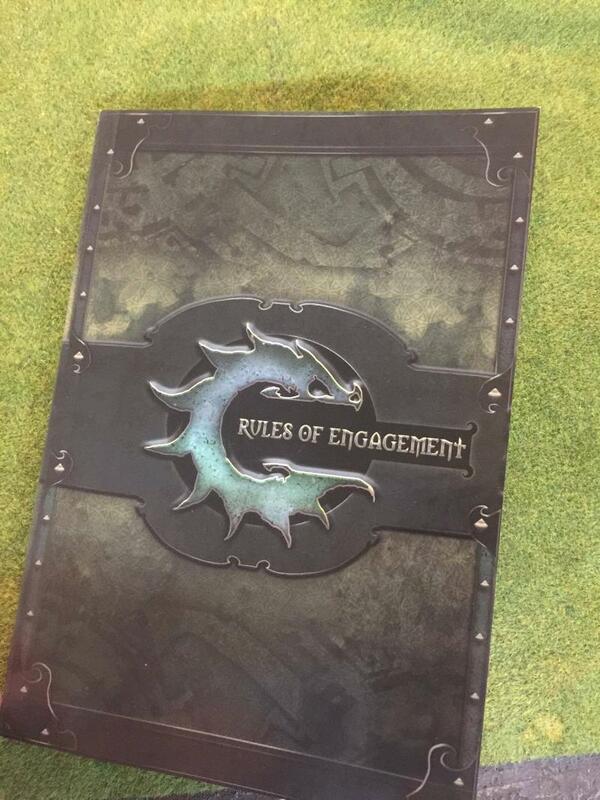 Because this game is specifically designed to be played on a 4x4" board! How I wish a solid rank and file rule set would come out with accompanying minis as lovely as these that was in 15mm scale.